World Summit on Food Security was held in Rome from November 16 to 18, 2009. The Summit has highlighted that people suffering from hunger and poverty now exceed 1 billion, and to feed a world population of 9 billion (expected) in 2050, agricultural output will have to increase by 70%. Hosted at the UN Food and Agriculture Organization (FAO) headquarters in Rome, Italy. One of the Strategic Objectives set during the Summit is to reduce the proportion and the number of people who suffer from hunger and malnutrition by half by 2015. The Summit Declaration has further set the Five Rome Principles for Sustainable Global Food Security. Invest in country-owned plans aimed at channeling resources to well-designed and results-based programmes and partnerships. Foster strategic coordination at national, regional and global levels to improve governance, promote better allocation of resources, avoid duplication of efforts and identify response gaps. Strive for a comprehensive twin-track approach to food security that consists of 1) direct action to immediately tackle hunger for the most vulnerable, and 2) medium- and long-term sustainable agricultural, food security, nutrition and rural development programmes to eliminate the root causes of hunger and poverty, including through the progressive realization of the right to adequate food. Ensure a strong role for the multilateral system by sustained improvements in efficiency, responsiveness, coordination and effectiveness of multilateral institutions. Ensure sustained and substantial commitment by all partners to investment in agriculture and food security and nutrition, with provision of necessary resources in a timely and reliable fashion, aimed at multi-year plans and programmes. Attended by over 4,700 delegates from 180 countries, including 60 Heads of State and Government as well as representatives of governments, UN agencies, intergovernmental and non-governmental organizations (NGOs), the private sector, and the media. Read the full Final Declaration of the World Summit on Food Security 2009 as pdf. 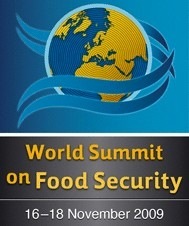 For more details, log on to World Summit on Food Security.